The cost of a lighting fixture or bulb is often the deciding factor in the decision to select one type of light over another. When reviewing cost do not simply consider the purchase price alone as that does not include potential operating cost. A complete evaluation includes all costs over the lifetime of the product. This includes purchase price, installation cost, maintenance cost, and operating costs. Many energy efficient products will pay back the initial costs over time by saving money during operation. This is why purchase price alone is not the best indicator. Let’s look at LED lighting as an example. Initial Cost – this is the purchase cost of the LED light bulb or fixture and any installation cost required. To simply replace one light bulb for another may not require installation services from a professional but installing a new fixture or retrofitting an existing fixture to work with LED bulbs will. An electrical contractor should be able to provide estimate on installation cost. 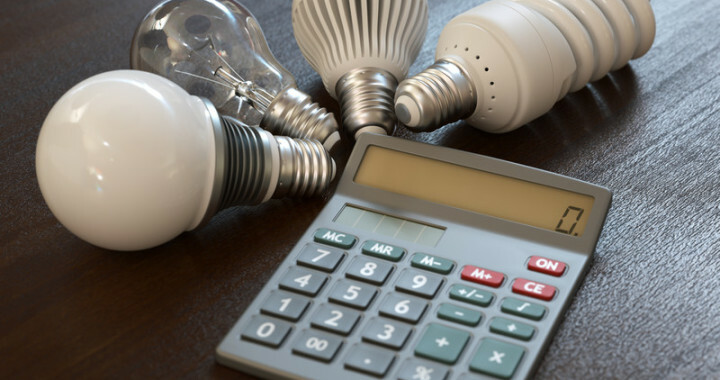 Incentives and Rebates – the government and utility companies may offer an incentive or rebate when selecting a lighting system that reduces energy consumption or is more environmentally friendly. The incentive or rebate has a net effect of reducing your cost and should be included in your evaluation. Energy Cost – this is the electricity cost to provide power to operate the light. Power is measured as wattage, more precisely, per kilowatts (1000 watts). The electric company charges by the kilowatt-hour (Kwh), for example $.12 Kwh (12 cents for one kilowatt used for one hour of time). One (1) 100 watt incandescent light bulb can operate for 10 hours using 1 Kwh of energy. This seems cheap but adds up quickly over time if used daily and with several light bulbs. Maintenance Cost – this is the cost associated to keep the lighting system operating. Common maintenance items are repairing failed components, replacing light bulbs, or replacing bulbs to maintain a minimum light level. The rated operating hours of the light bulb is a good indicator of how often the bulbs will need replaced. Let’s compare replacing fluorescent bulbs with LED bulbs in troffer light fixture. Philips 4ft T8 32-watt soft white fluorescent bulb, Model 409433, $29.97 per 10-pack, 2950 lumens, 20,000 hour life. Philips 4ft T8 14.5-watt (32-watt equivalent) InstantFit direct replacement LED linear bulb, Model 433060, $237.22 per 10-pack, 1600 lumens, 40,000 hour life. Pricing and product data from Home Depot website. Alliant Energy offers rebate to businesses for replacing fluorescent lights with LED lights at 40 cents per watt saved. Assumes 3000 hours per year (equal to ~8 hours per day/7 days per week or ~11.5 hours per day/5 days per week) x electrical rate $.12 kwh x wattage (kw) x 10 years system life. Maintenance cost includes replacement bulb cost and labor. Fluorescent system requires all lamps to be replacement one (1) time to reach 10 year system life. What is your ROI, or when does the savings pay for the upfront costs? First determine the yearly operating savings ($492 – $201 = $291) and then divide by the number of years (10). In this example the yearly savings is $29. The payback period (ROI) is determined by dividing the Initial cost by the Yearly Savings ($88/$29 = 4). The ROI for above LED linear bulbs is 4 years. If you have lighting questions or would like to schedule a technician to perform lighting maintenance, please contact McGill’s Repair and Construction at 641-437-1086. Article written by Tim McGill, editor@Tree Branch Publishing. Many light bulbs will produce less light over time as the light bulb reaches its end of life. LED light bulbs may continue to operate for many 1000’s of hours beyond the useful life. Posted in Electrical, Energy Savings, Lighting and tagged Alliant Energy, energy cost, Fluorescent Troffers, kilowatt-hour, LED, LED Lighting, rebates. Solar Energy, Is a solar panel system right for me?